Note: Every single syllable of every word Dr. Roberts writes below is accurate. The only “sidebar” I would add is that, for many of you who voted for Obama, Obama reneged on his promise to roll-back everything the Bush Admin had done to destroy the Constitution and made every Bush initiative more Constitutionally destructive. FBI Director James Comey got Hillary off the hook but wants to put you on it. He is pushing hard for warrantless access to all of your Internet activity. Comey, who would have fit in perfectly with Hitler’s Gestapo, tells Congress that the United States is not safe unless the FBI knows when every American goes online, to whom they are sending emails and from whom they are receiving emails, and knows every website visited by every American. In other words, Comey wants to render null and void the Fourth Amendment of the US Constitution and completely destroy your privacy rights. The reason Washington wants to know everything about everyone is so that Washington can embarrass, blackmail, and frame on felony charges patriots who stand up in defense of the US Constitution and the rule of law, and dissidents who criticize Washington’s illegal wars, reckless foreign policies, and oppression of American citizens. Washington’s demand for power has nothing to do with our security. It has to do with destroying the security that the US Constitution gives us. 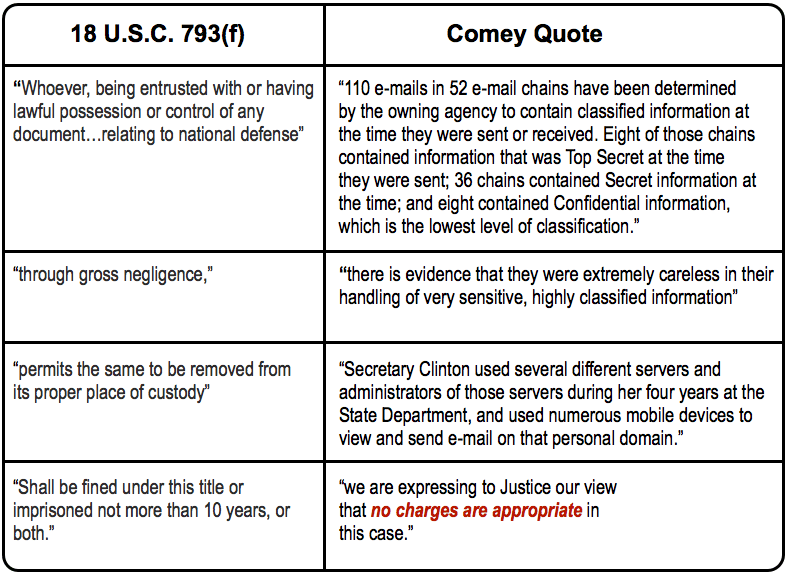 The security that Comey wants to protect is not our security or the national security of the United States. Comey’s intent is to make Washington secure despite its violations of statutory law and the US Constitution. The way Comey intends to do this is by intimidating, harassing, and arresting Washington’s critics. Comey wants the unconstitutional power to demand from the providers of telephone and Internet services all records and information about you. These demands are not to be subject to oversight by courts, and the communication companies that serve you are prohibited from telling you that all of your information has been given to the FBI. US Senators rushed to stick their swords into the Fourth Amendment. John Cornyn slapped an FBI-written amendment on the Electronic Communications Privacy Act Amendments Act of 2015. This caused the American Civil Liberties Union and Amnesty International to withdraw their support for the act, which caused the act to be withdrawn. Senator John McCain rushed to the aid of the FBI. This Constitution-hating senator proposed an amendment to a criminal justice appropriations bill that would use a provision in the unconstitutional PATRIOT Act to grant the unlimited unaccountable power to the FBI to totally destroy your privacy. McCain’s amendment failed, but Senate Majority Leader Mitch McConnell (R-KY) changed his vote so that he could negate the Senate’s vote with a vote to reconsider. The FBI’s senators will continue with amendments to legislation, related or not, until they deliver to the FBI the power it wants. Unfortunately, most Americans today, unlike their forebears, are too ignorant and uneducated to know the value of the privacy rights that our Founding Fathers put in the US Constitution. The imbeciles say nonsense such as: “I haven’t done anything wrong. I have nothing to fear.” God help the imbeciles. If the American people were sufficiently sophisticated, they perhaps would wonder why such a large chunk of the US Senate had rather represent the FBI than the American people, their constituents who elected them to represent the people in the state, not a police power in Washington. Why are so many US senators more responsive to the FBI’s desire for Gestapo police power than they are to the civil liberties embodied in the US Constitution? As the Bill of Rights Defense Committee and the Defending Dissent Foundation show, the Orlando shootings, the Dallas shootings and whatever shootings, real or staged, next occur have nothing to do with the FBI’s demand to completely destroy all privacy rights of the American people. What’s that I hear? You say you knew nothing about this? Little wonder. Your media consist of people well paid to deceive you and to deliver you into a Police State. To strip you of all constitutional protection and deliver you unprotected to a police state is the function of the New York Times, Washington Post, Fox «News», CNN, the rest of the presstitute print and TV media and many Internet sites. The entire process to exonerate Hillary was highly orchestrated. The canary in the coal mine was the illegal meeting between Loretta Lynch and Bill Clinton. The Lynch/Comey connection stretches back to 2013 via HSBC and the Justice Department’s decision to not prosecute HSBC for money laundering on behalf of drug dealers and terrorists (note: HSBC is one of the primary Comex bullion banks and the “custodian” of the gold in the GLD trust). Comey was put on HSBC’s board of directors. The Clinton’s and James Comey go back over 20 years. In his last day in office, Bill Clinton pardoned 450 people. One of those pardoned was Robert Palmer who pleaded guilty for his part in the Clinton’s “Whitewater” scandal. The biggest pardon was for fugitive Marc Rich, who fled the U.S. to Switzerland to evade $100’s of millions in taxes on his commodity trading profits. Bill Clinton was blatantly sleeping with Marc Rich’s wife, Denise, in their Fifth Avenue penthouse as part of the price for the pardon.